On Thursday, Feb. 21, 2019, Jerald Lee Cutsforth passed away in Crescent City at the age of 80. Jerald was born Feb. 11, 1939, in Woodburn, Oregon, to Hugh and Jane Cutsforth. Jerald was raised in Gervais, Oregon. As a young teen he contracted polio and with several surgeries and physical therapy he beat the disease. He graduated from Gervais High School in 1957. He then attended the Oregon Institute of Technology, where he worked his way through school by working in the saw mill at night and then going to school in the day. Jerry was a club member of the Crescent City Jaycees. He was involved with the first ever Jaycees Basketball Tournament in 1968. He was president of the club in 1973-1974. He was still an active member and achieved senatorship within the club. He also was a member of the Elks Lodge for 26 years. His hobbies included hunting, fishing, crabbing, digging clams, hunting for agates, playing cards and trying his luck on the slot machines. Jerry was an easy going guy with a love for the beautiful surroundings this area has to offer. He knew a lot of people and was always stopping to have a conversation with someone. After retiring he spent many mornings down at Fisherman’s Restaurant drinking coffee and telling stories with some of the other locals. He frequently cruised the harbor checking out the boats. For the last couple years my sister and I went to lunch on Tuesdays with Dad. We always went for a ride afterwards, cruising the harbor, checking out the Elk herds, driving the beach and the airport. We are truly going to miss those days with our dad and the talks we had with him while driving around. He will be greatly missed by family and his many dear friends. Jerald is survived by his sister Betty Robinson of Aloha, Oregon; his daughter, Lisa (Nick) Bolshakoff and their children, Darrin and Emily; daughter, Tami Hartwick and her son, Daniel; and daughter, Lynn Curry of Redding. He is also survived by his late wife, Judy Boss; her daughter, Kelly Boss and her children Kristen, Taylor, Peyton, Parker and Slayden. Also survived by cousins, nieces and nephews. 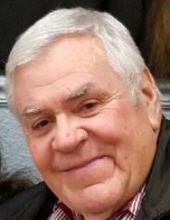 He is preceded in death by his parents, Hugh and Jane Cutsforth; brother, Ronald Cutsforth; wife, Judy Boss; and granddaughter, Ashley Hartwick. To plant a tree in memory of Jerald Lee Cutsforth, please visit our Tribute Store. "Email Address" would like to share the life celebration of Jerald Lee Cutsforth. Click on the "link" to go to share a favorite memory or leave a condolence message for the family.